Our Simi Valley dental office places an emphasis on preventative dentistry which involves prophylaxis or teeth cleaning. 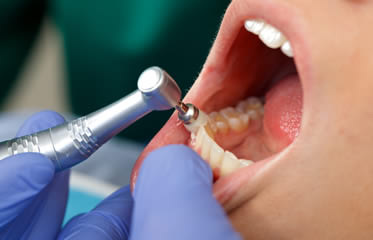 A dental prophylaxis is performed on patients in order to have the teeth and gums thoroughly cleaned. Getting a prophylaxis or teeth cleaning is necessary in order to help avoiding illnesses that may develop when the procedure is not performed, such as gingivitis or periodontal (gum) disease. Plaque and tartar is removed: This goes for above and below the gum line. Too much build-up of any of these two harmful substances can lead to severe periodontal disease. We advise our Simi Valley patients to keep in mind that build-up can occur even when healthy oral care habits are practiced. A professional dental cleaning or prophylaxis is needed routinely in order to ensure that all debris is removed in a timely manner. Unsightly tooth stains can be removed: Minor discoloration can occur when teeth are dirty and plaque or tarter has been allowed to build-up. With a prophylaxis or dental cleaning performed at our Simi Valley dental office, these stains will be improved dramatically. Breath becomes fresher: Bad breath which is otherwise known as Halitosis, is often created when rotting food particles in your mouth mix with bacteria. A dental cleaning is specifically performed to rid your mouth of all of these, which will result in fresher breath. Comprehensive Examination: Even though an exam is not necessarily a part of a dental prophylaxis in the sense that it is not part of the actual teeth cleaning of your mouth, however, you can expect to have a dental exam completed by our Simi Valley dentist, Dr. Muradian, right after a dental prophylaxis to ensure that everything in your mouth is as it should be, promoting your oral health. Our dentist, Dr. Muradian, in Simi Valley recommends that a dental prophylaxis be completed once every 6 months when maintaining healthy oral care habits. However, some patients that visit our Simi Valley dental office may need to see our dentist more often. Contact us for more information about getting a dental prophylaxis or teeth cleaning if you are due for one or even if you are unsure. Take care of your smile while you can!